Keep cool under the Tall Pines! Nestled among the tall pines Ruidoso is famous for in a great location. Perfect for 2 couples or a family, our cabin is excellent for vacation away from the heat, a ski trip or a golf trip with friends. Comfortable new furnishings in the living area allow you to relax in front of a crackling fire as you watch your favorite movie on the new 55" Smart TV or read a book. Only about 1/2 mile to Cedar Creek Trail Head for great mountain biking and hiking; Close to Cedar Creek at Lincoln National Forest for fitness trails, hiking & more. Minutes into Uptown and Midtown Ruidoso restaurants and shopping & the Ski Apache turn off is just 2.7 miles! Eagles Landing is in a great location, convenient to everything yet private, in a very nicely kept neighborhood with mostly weekend vacation homes. Our 2018 renovations include: New hardwood flooring, two comfortable bedrooms with new mattresses, new pillows, 100% cotton sheets, blankets and quilts for your comfort and all our bedding has pillow & mattress protectors and pads. The bedrooms have black out curtains to help you sleep, or sleep in late if you like! Our living room has a new 55" Smart TV with Roku and 1000's of movies and TV shows to choose from, new sofas, dining table area and area rugs. New appliances, cookware, dishes; renovated bathroom as well. Outside we have a six person clean and steamy new hot tub. We have a gas grill on the back deck as well as outdoor furniture where you can enjoy your morning coffee or sit and take in the sun, plus a picnic table under the cool tall pines. As a thank you for being our guest, you will receive two "Eagles Landing" camp mugs to take home with you! Ski Apache turn off is just 2.7 miles and all restaurants, shopping and activities in Uptown and Midtown Ruidoso are just 7 minutes away (just about 2.5 miles). Disc golf and horseback riding are just minutes away. Inn of the Mountain Gods Casino and Championship Golf, and Billy the Kid Casino are only about 10 minutes away. The Links at Sierra Blanca is less than one mile away for some of the best golf in New Mexico. Eagles Landing is excellent for a getaway for a couple (or two) or your family. A maximum of 6 guests can be accommodated, with a maximum of 4 adults. *We are always happy to offer early check in/late check out when we do not have back to back rentals. No promises, but do not hesitate to ask! *Your dog is welcome. Pet fee of $39 applies. No other pets please. *Rate is for a maximum of 4 adults and 2 children. Home is 2 bedroom 1 bath and does not accommodate 6 adults well. If you book with more than 4 adults a fee of $20 per night for the 5th and 6th guest will be charged. *4th of July, Memorial Day, Easter Sunday and Labor day check in/out will require an additional overtime cleaning fee. **Owner is not responsible for weather, road conditions, road work or detours. It is the responsibility of our guests to have 4WD, snow tires or tire chains during inclement weather. We loved the potential and wanted to renovate this cabin. We love the location. We also own property 4130510 on Homeaway in Ruidoso and 381847 at Deep Creek Lake, Maryland. See our reviews so you know how we treat our guests and how clean we keep our cabins. Thank you! Basic spices - salt, pepper, garlic and others. No Cable, but we have 2 Smart TVs with ROKU. 1000's of movies and TV shows to choose from, with live TV, HULU, Sony Crackle, ABC/NBC News , HGTV and so much more. Better than Cable! Plenty of space for kids to run and a picnic table under the pines. Lots of historic sites, including Lincoln County (where Billy the Kid had his shoot out) is just 20 miles away. After you book, we are happy to suggest some of our favorite places to dine. **Your dog is welcome, with permission only. A $39 pet fee will apply **Please note: sorry for any inconvenience, but due to cleaning crew availability: *No check in/check out on Christmas Day, Easter Sunday or Thanksgiving without additional fee. 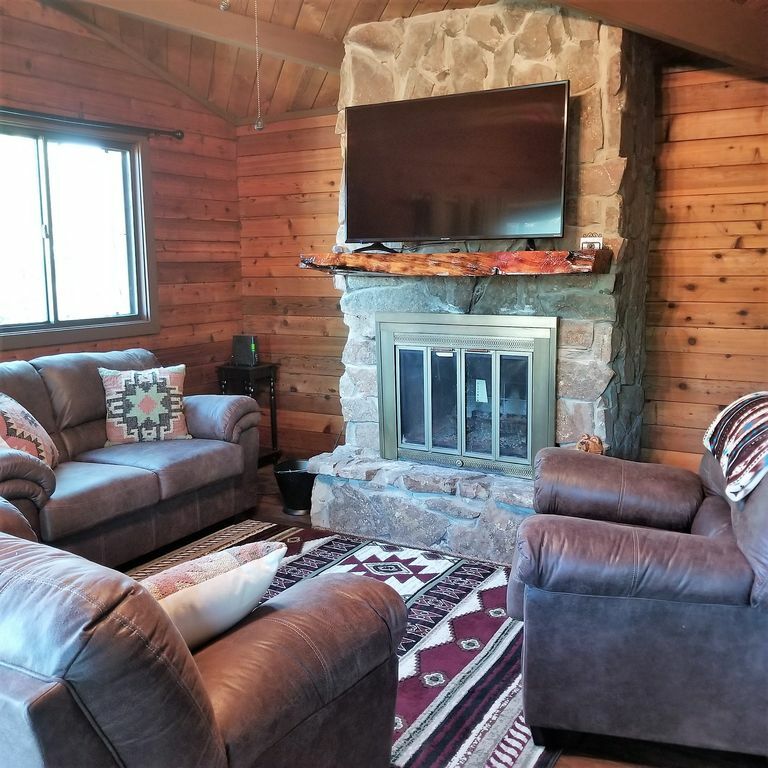 *Check in/Check out on July 4th, Memorial Day & Labor Day will require a holiday overtime cleaning fee **This home is located in an area over 7500 feet above sea level. There is the potential for a lot of snow. **Owner is not responsible for weather, road conditions, road work or detours. It is the responsibility of our guests to have 4WD, snow tires or tire chains during inclement weather. *We provide Ice Melt for the walkway and outside steps and a snow shovel for your convenience. My husband and I and our 13 year old daughter stayed here and loved it! Close to downtown and restaurants but tucked away enough for plenty of peace and quiet. We took day trips to White Sands, Lincoln and Cloudcroft and came home and jumped into the hot tub and built a fire each night. Complete relaxation and all the amenities one needs. Highly recommend this cottage. Great place to stay. Everything was very clean and as described. Awesome location too. Very close to everything. I would stay here again. We enjoyed our stay at Eagles Landing . Very clean & well stocked with amenities. Great get away. We really enjoyed our stay at Eagles Landing! Very cozy and clean! Doris, the owner, was wonderful to work with! Thanks so much for being a great guest! You and your family are welcome back anytime. My family and I loved this property and our stay. Great Cozy Cabin and great location with all the amenities we were looking for. Thanks for coming Juan. Please come back again soon! Eagles landing was an amazing cabin for our Christmas getaway to the mountains. Quant and cozy & equipped with all the amenities needed not only for us but also for my little grandson, such as highchair, play yard...definitely a plus for us!! My family took advantage & enjoyed time in the hot tub & grilling out! Great location, private, clean & convenient to midtown, overall our stay was memorable & amazing!! Thanks to Doris Sullivan for all her help in making sure our stay was enjoyable! Thanks so much! I'm glad you enjoyed your Christmas in Ruidoso. Thank you for being such a great guest. Hope you come back again! The cabin is conveniently located just 2.7 miles to the Ski Apache turn off. Coffee shops are restaurants are a under a mile away. Uptown and Midtown Ruidoso is just a 5 minute drive, casinos are both just 10 minutes away.